Win This Oil Painting By Coming To My Upcoming Exhibit! You have a chance to win this painting simply by coming to see this show. This is the study for the larger painting that’s on the cover of the invitation for “Illuminating Landscapes,” a solo show that benefits The Land Trust for Tennessee. It’s 12″ x 16,” oil on panel. Just come to the exhibit, sign up and the drawing will be held at the end of the exhibit. The drawing will be videotaped and posted on Facebook April 29th. So come on over to Franklin, TN for this chance to win original art by Rachael McCampbell. What? 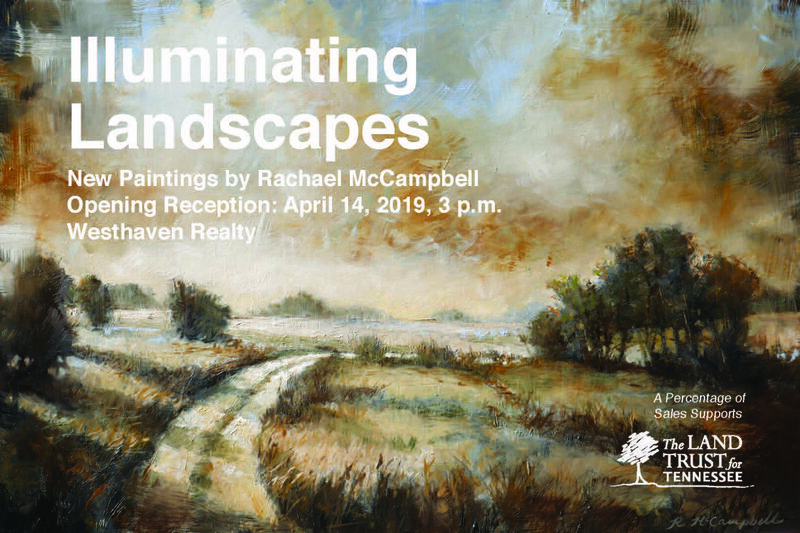 “Illuminating Landscapes,” a solo art show of work by Rachael McCampbell which will benefit The Land Trust for Tennessee. Who? Everyone is welcome. 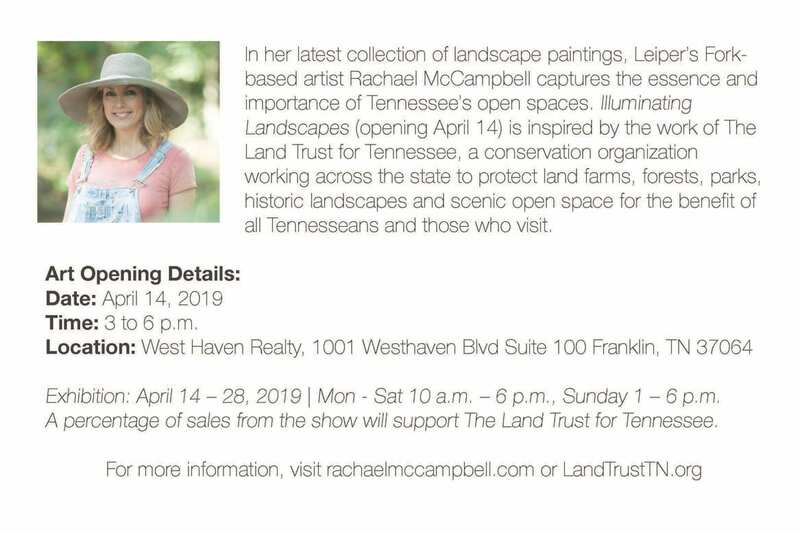 Please come support The Land Trust for Tennessee! They are an amazing organization who help preserve our open spaces and make this state even more beautiful. Please come join us for an afternoon of celebration and art! The Land Trust for Tennessee has protected our open spaces for over 20 years now! From family farms, to city parks, to forests spanning thousands of acres, the work of The Land Trust has a lasting impact on people and places from Memphis to Johnson City. Having grown up on a farm in East Tennessee, I have always felt a strong connection to the land. I was fortunate enough to grow up on a beautiful farm with views of both the Cumberland Plateau and the Smoky Mountains. A branch of the Tennessee River ran through part of it–the rolling hills and forests were stunning. In about 1983, our farm was taken by the county to build a large industrial park. As our farm was like a third parent to me, this event deeply affected me. It was a huge loss to see this beautiful property get demolished and covered over with roads and commercial buildings. I wish it had been preserved. That’s why I want to help the Land Trust of Tennessee continue its good work. They are committed to helping our state make wise choices for land preservation. Development is inevitable but there are smart ways to do it while still considering the needs of our flora and fauna, keeping clean water sources and aesthetic views. I was honored by this invitation to paint a series of paintings inspired by these protected lands. I have enjoyed painting streams, fields, skies and buildings too for this exhibit. Tennessee has breathtaking views wherever you go. We are blessed by the natural beauty that surrounds us–my prayer is that we can hang on to these lands for our children’s children. 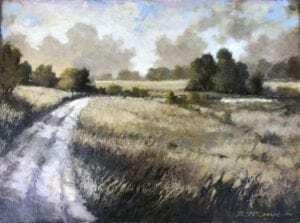 A portion of the sales of my art will benefit the Land Trust. 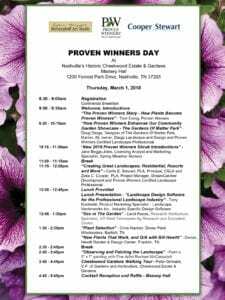 So please come to this event at Westhaven Realty, 1001 Westhaven Blvd. Suite 100, Franklin, TN 37064 to see my latest works. 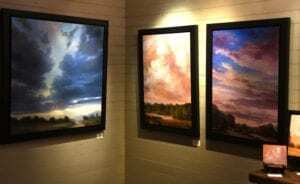 Thank you to The Copper Fox Gallery for a wonderful opening reception of my newest paintings, “Skyscapes Reimagined” on November 17th. There were wonderful friends who came to cheer me on and to see my newest work and a lot of people I had never met. I really appreciated everyone showing up to support the arts in that way! My paintings will be on view this month, December 2018, so please come on by the gallery. Address: The Copper Fox Gallery, 4136 Old Hillsboro Road. Hours: Monday- 11-3, Tuesday-Saturday 10-5 and Sunday 11-5. And Happy Holidays!!!! TO SEE MORE PICS FROM THE OPENING BY RON MANVILLE, PLEASE READ MORE….. I Loved Teaching A Workshop At Arrowmont Oct. 14-20, 2018! 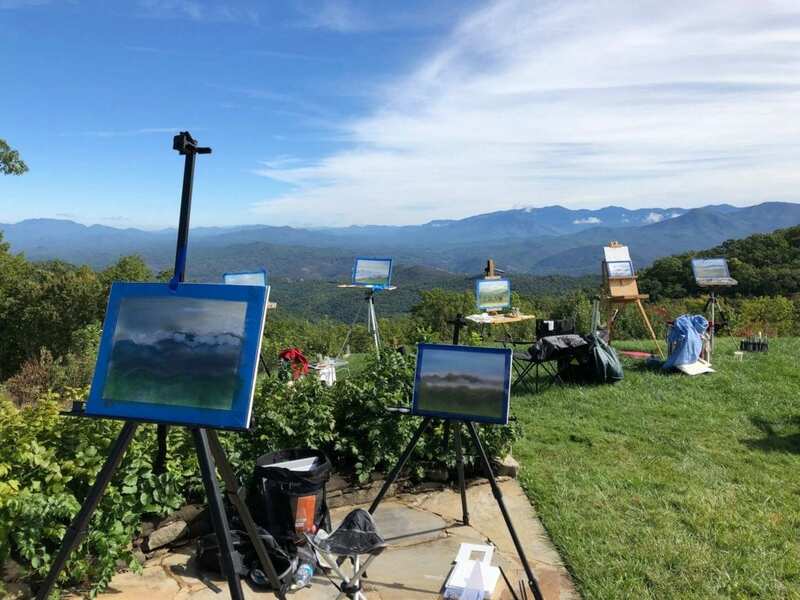 Painting on a private 4,000 acre property at the top of the Smoky Mountains. Breathtaking! The leaves were changing and the weather was brisk. It was a perfect time to lead a workshop in the mountains of East Tennessee at The Arrowmont School of Arts and Crafts. I had 15 eager and talented students who painted, took photos and generally took in the beauty around them. We painted cabins, fields, creeks and a stunning 180 degree mountain panorama from the top of the Smoky Mountains. It was astounding! I really enjoyed getting to know these ladies. We often ate lunch and dinner together or shared a glass of wine at the end of the day by a fire. I saw a few black bears too which made the week even more exciting. Here are a few pictures to share with you so you can get a sense of where we were. Some of the art you’ll see were paintings and exercises in progress. Enjoy! 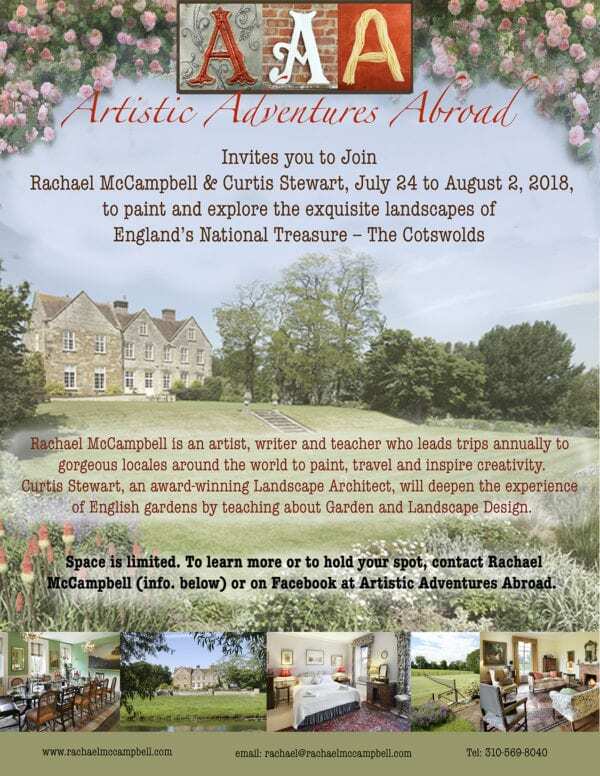 Continue reading I Loved Teaching A Workshop At Arrowmont Oct. 14-20, 2018! 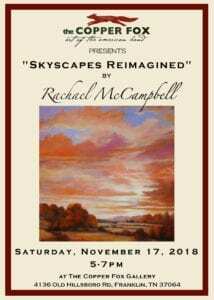 Please join me for a glass of wine and to see my newest paintings of “Skyscapes Reimagined.” I’d love to have you there. I have 25 new works of art to share with you. I love painting clouds and moody skies. They thrill me! I hope you like them too. The show will be up into December if you cannot make the opening reception. 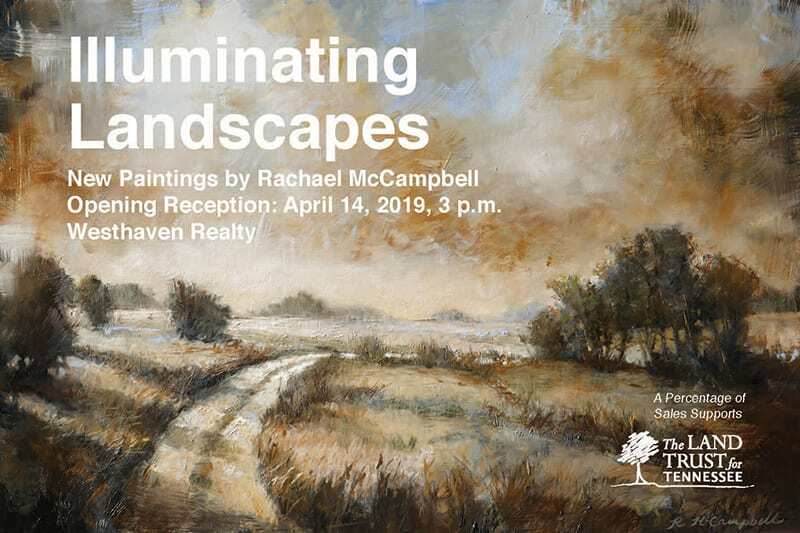 Rachael McCampbell demonstrated Gamblin Oils at Plaza Art on October 27/28, 2018, from 11 – 5 pm each day. 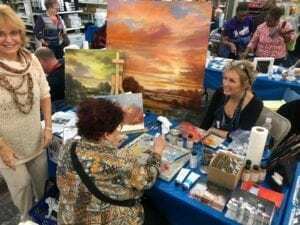 It was a wonderful weekend where hundreds of art enthusiasts played with oils, got free gifts from Gamblin and enjoyed all the other vendors there as well. It was a great weekend to celebrate the joy of creating art by getting your hands dirty and trying new things. Thank you, Gamblin for the opportunity to show off your amazing products! 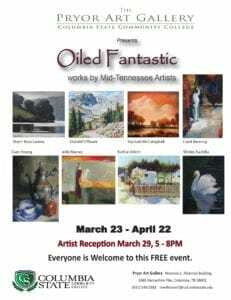 Join several middle Tennessee oil painters for the exhibit, “Oiled Fantastic,” who are showing work at the Pryor Art Gallery in Columbia, TN March 23 – April 22, 2018. The opening reception is March 29th, 5 – 8 pm. I hope to see you there! The beautiful Villa we will be staying in. Another creative adventure lies ahead this August 30 – September 9, 2017, Cortona, Italy! I’m taking a group of 14 guests to Cortona, Italy this fall to an amazing villa on gorgeous grounds with olive groves, a swimming pool, fountains and more. We will experience the joys of painting plein-air, hand-making pasta, truffle hunting, antiquing, seeing ancient churches and masterpieces of art while traveling to beautiful spots like San Gimignano, Siena, Volterra, Arezzo and of course Cortona!